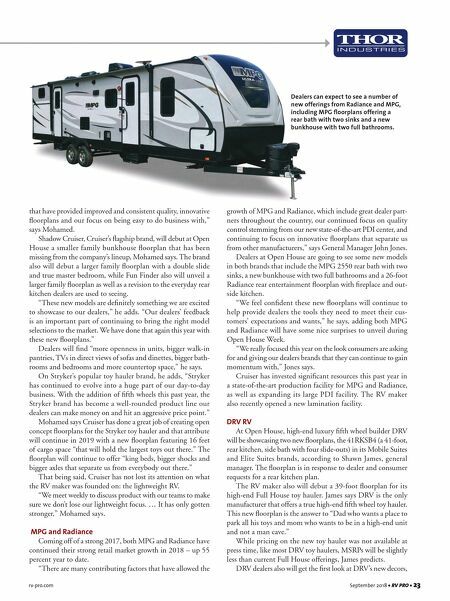 rv-pro.com September 2018 • RV PRO • 23 that have provided improved and consistent quality, innovative floorplans and our focus on being easy to do business with," says Mohamed. Shadow Cruiser, Cruiser's flagship brand, will debut at Open House a smaller family bunkhouse floorplan that has been missing from the company's lineup, Mohamed says. The brand also will debut a larger family floorplan with a double slide and true master bedroom, while Fun Finder also will unveil a larger family floorplan as well as a revision to the everyday rear kitchen dealers are used to seeing. "These new models are definitely something we are excited to showcase to our dealers," he adds. "Our dealers' feedback is an important part of continuing to bring the right model selections to the market. We have done that again this year with these new floorplans." Dealers will find "more openness in units, bigger walk-in pantries, TVs in direct views of sofas and dinettes, bigger bath- rooms and bedrooms and more countertop space," he says. On Stryker's popular toy hauler brand, he adds, "Stryker has continued to evolve into a huge part of our day-to-day business. 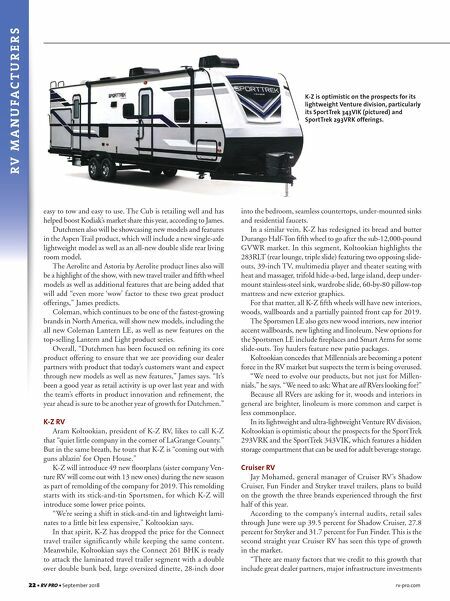 With the addition of fifth wheels this past year, the Stryker brand has become a well-rounded product line our dealers can make money on and hit an aggressive price point." Mohamed says Cruiser has done a great job of creating open concept floorplans for the Stryker toy hauler and that attribute will continue in 2019 with a new floorplan featuring 16 feet of cargo space "that will hold the largest toys out there." The floorplan will continue to offer "king beds, bigger shocks and bigger axles that separate us from everybody out there." That being said, Cruiser has not lost its attention on what the RV maker was founded on: the lightweight RV. "We meet weekly to discuss product with our teams to make sure we don't lose our lightweight focus. … It has only gotten stronger," Mohamed says. MPG and Radiance Coming off of a strong 2017, both MPG and Radiance have continued their strong retail market growth in 2018 – up 55 percent year to date. "There are many contributing factors that have allowed the growth of MPG and Radiance, which include great dealer part- ners throughout the country, our continued focus on quality control stemming from our new state-of-the-art PDI center, and continuing to focus on innovative floorplans that separate us from other manufacturers," says General Manager John Jones. Dealers at Open House are going to see some new models in both brands that include the MPG 2550 rear bath with two sinks, a new bunkhouse with two full bathrooms and a 26-foot Radiance rear entertainment floorplan with fireplace and out- side kitchen. "We feel confident these new floorplans will continue to help provide dealers the tools they need to meet their cus- tomers' expectations and wants," he says, adding both MPG and Radiance will have some nice surprises to unveil during Open House Week. "We really focused this year on the look consumers are asking for and giving our dealers brands that they can continue to gain momentum with," Jones says. Cruiser has invested significant resources this past year in a state-of-the-art production facility for MPG and Radiance, as well as expanding its large PDI facility. The RV maker also recently opened a new lamination facility. DRV RV At Open House, high-end luxury fifth wheel builder DRV will be showcasing two new floorplans, the 41RKSB4 (a 41-foot, rear kitchen, side bath with four slide-outs) in its Mobile Suites and Elite Suites brands, according to Shawn James, general manager. The floorplan is in response to dealer and consumer requests for a rear kitchen plan. The RV maker also will debut a 39-foot floorplan for its high-end Full House toy hauler. James says DRV is the only manufacturer that offers a true high-end fifth wheel toy hauler. This new floorplan is the answer to "Dad who wants a place to park all his toys and mom who wants to be in a high-end unit and not a man cave." While pricing on the new toy hauler was not available at press time, like most DRV toy haulers, MSRPs will be slightly less than current Full House offerings, James predicts. DRV dealers also will get the first look at DRV's new decors, Dealers can expect to see a number of new offerings from Radiance and MPG, including MPG floorplans offering a rear bath with two sinks and a new bunkhouse with two full bathrooms.